Barcelona forward Lionel Messi has won the Ballon d’Or award for the fifth time. United States’ 33-year-old midfielder Carli Lloyd, who scored a hat-trick in the World Cup final, won the women’s award. Barcelona coach Luis Enrique won the world coach of the year award after winning six trophies in 2015, including the Champions League, La Liga and the Copa del Rey. United States coach Jill Ellis was named women’s football world coach of the year after leading her country to World Cup glory in the summer. Atletico Goianiense’s Wendell Lira won the goal of the year award for his overhead kick against Goianesia in Brazil’s Goiano state league. Fair Play Award went to every football club and organisation supporting refugees. Messi, when asked which was the greatest moment of this year: “It’s hard to say,” Messi said while laughing. He was then asked if he would swap five Ballon d’Or trophies for a FIFA World Cup. Messi was then asked whether Neymar will soon be his successor at Barcelona. The obvious question was also asked – What did Messi feel about the rivalry between him and Ronaldo? The 30-year-old was then asked about his love for the no.7 shirt and he told the press about the story of how he got the shirt at Manchester United. “When I arrived at Man United, I asked for 28 but the coach said ‘No, you will wear 7’,” Ronaldo explained. Ronaldo was also asked what he liked about Messi and which trait he’d love to have. The Brazilian was also asked about his own form and achievements in the past year. The voting for football’s most prestigious individual award was done by the captain, manager and one selected journalist for each country that is a member of FIFA. The Argentine had 41.33% of the vote, with Portuguese forward Cristiano Ronaldo (27.76%) second and Brazilian Neymar (7.86%) third. Pakistan head coach, Mohammad Al-Shamlan, voted for ageing Dutch winger Arjen Robben as the best player in the world in 2015. You can find the full list of all the votes cast here. 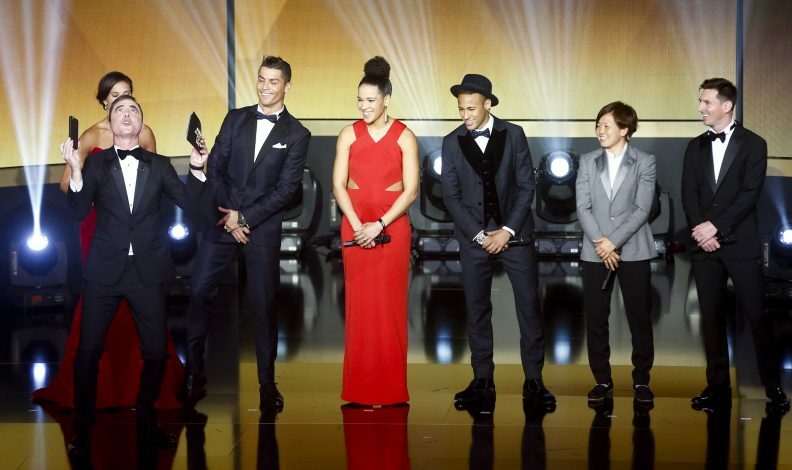 La Liga dominated the Fifa Team of the Year, with only 3 of the 11 players not based in the Spanish league. Barcelona and Real Madrid both boast four players apiece in the team of the year – whereas last year, the La Liga giants only had five representatives between them. The 26,478 votes received is a new record for the team, with votes collected from 68 countries. The team in full is: Manuel Neuer (Bayern Munich); Dani Alves (Barcelona), Thiago Silva (PSG), Sergio Ramos (Real Madrid), Marcelo (Real Madrid); Andres Iniesta (Barcelona), Luka Modric (Real Madrid), Paul Pogba (Juventus); Neymar (Barcelona), Lionel Messi (Barcelona), Cristiano Ronaldo (Real Madrid).